It seems that, despite the claims of the owner/developer of Brook House in Tiptree, Essex, English Heritage haven’t said that the house should be demolished. Following on from the earlier story (Another house at risk from a developer: Brook House, Tiptree, Essex – 25/11/09) a local resident has flagged up a new story with EH now saying that although they believe the house to be in poor condition they have not said it should be demolished. 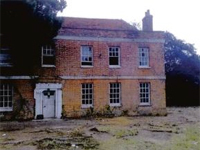 John Neale, English Heritage team leader for Essex, has confirmed that they are still examining the application – leaving the statements of the owner in his application to demolish looking somewhat precarious. Let’s hope that EH, and Colchester Council listen to the concerns of the local residents and Tiptree Parish Council and not only refuse the demolition but also serve an urgent works notice to save this interesting part of the local architectural heritage. This entry was posted in At Risk, News and tagged brook house, buildings at risk, development, english heritage, essex, restoration. Bookmark the permalink.